But this will not sit well with a sensitive India, given the history of Sino-Indian rivalry. 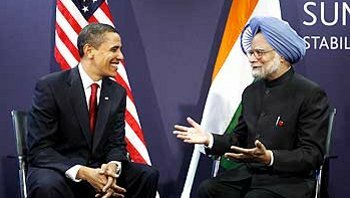 Only recently the Indian officials, says a Washington Post report, in an outburst of Brahmanic self importance expressed concern that New Delhi has suddenly been relegated to the second tier of U.S.-Asian relations because Obama did not mention India in his speech on US relations in Asia recently. The speech was delivered in Tokyo and focused on the Asia-Pacific region and not South Asia. This, the Indians believe, is Obama’s failure to recognize India’s broader regional aspirations, something that the Bush administration had encouraged. The Indians were upset that “Washington was leaning too closely to China”.